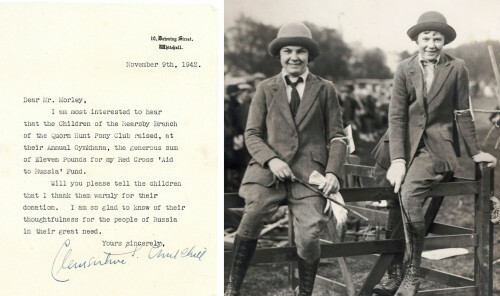 Quorn Hunt Pony Club was started in 1929 by Betty Morley and her sister Angela, and it was evident that by 1942 the club had an active membership. During 1942, a group led by Betty, raised the sum of £11.00, which was sent to Clementine Churchill, the wife of the Prime Minister, Winston Churchill, for her Red Cross ‘Aid to Russia’ fund. I am most interested to hear that the children of the Rearsby Branch of the Quorn Hunt Pony Club raised, at their Annual Gymkhana, the generous sum of Eleven Pounds for my Red Cross ‘Aid to Russia’ Fund. Will you please tell the children that I thank them warmly for their donation. I am so glad to know of their thoughtfulness for the people of Russia in their great need. Betty Morley was born in 1915 and was involved with horses and ponies all her life, until her death in 1980. The photograph shows Betty on the left and her sister Angela on the right. Note: Quorn Hunt began in 1753 and was based at Quorn Hall. Although they moved out of the parish in 1906, the presence of the hunt for all those years heavily influenced the development of Quorn and links with the village were still strong.